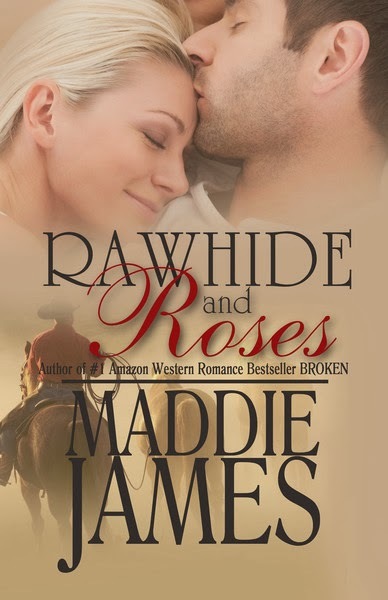 The Un-Official Blog of Romance Author Maddie James: Cowboys are my heroes! Rawhide and Roses—She’s roses, he’s rough-and-ready rawhide. Kim Martin is hardly equipped for a Colorado camping trip, especially when her mountain guide is a rough-edged cowboy who is as untamed as the wilderness. Thad Winchester’s patience for city women is wearing as thin as the seat of his jeans. But there is something about Kim that puts his hard-and-fast don’t-touch rule to the test. Kim Martin squinted, staring ahead at the string of horses leading up the mountain. She didn’t see the pines, or the azure sky, the big white puffy clouds, or the snow-topped Rockies in the background. No, all she saw in front of her was a bunch of horse’s asses—and cowboys. Which may, or may not, be one and the same. “What?” Jillie must have asked her a question, for it seemed she was expecting an answer. Kim tightened her grip on Rosie’s reins and straightened her back. “Oh, and I suppose you think that’s funny?” She risked letting go of the reins a second while reaching to rub Rosie’s neck. See, she wasn’t afraid. A wry grin broke his face, then he glanced back at Jillie who flashed him a healthy smile. He tipped his hat to Kim before he turned his horse around and started toward the middle of the string. Kim turned her gaze on her so-called friend. “Ha, ha.” Kim let her gaze fall from Jillie’s face to the pack of horses in front of her. She couldn’t help it if she didn’t own a pair of riding boots, could she? Her Skechers were as close to sporty as she owned. “Isn’t he cute?” Jillie tossed over her shoulder, her gaze riveted to the cowboy. Mack? And when did you make this intimate acquaintance, my friend? “Oh. Yeah. I guess.” For a cowboy. She huffed out an exasperated breath. Cowboys, in her limited experience, were not cute. They were scruffy and dirty and rude and ill-mannered. Other one? “Who?” She was beginning to sound like an owl. She glanced to the lead horse. Ah, yes. Thad Winchester. The owner of the ranch and their leader extraordinaire. He’d certainly left a lasting impression before they’d started out. To say the least, she wasn’t impressed. He was about as cute as a porcupine and as gruff as an old grizzly. Too business-like. The way he’d shouted instructions before they’d started the trail ride, you’d have thought they were getting ready to head into battle, or something. “So what do you think of him?” Jillie asked. Kim didn’t give two hoots about any old cowboy. She’d take a suit and tie and wing tips any day. She liked a man to smell of after-shave, new leather, and squeaky clean soap. She liked a man to drive a sleek sports car, shiny and smooth, not straddle the back of an animal. Kim required polish. Sophistication. A glimmering diamond. Preferably one who came bearing roses. Thad Winchester just didn’t fit the bill.